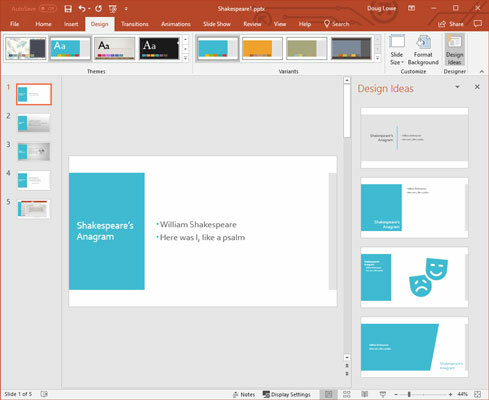 The Design Ideas feature in Microsoft PowerPoint 2019 examines the content of a selected slide and offers you a variety of design choices based on what it finds. To use this feature, simply select a slide that you think needs some improvement and click the Design Ideas button in the Design tab. 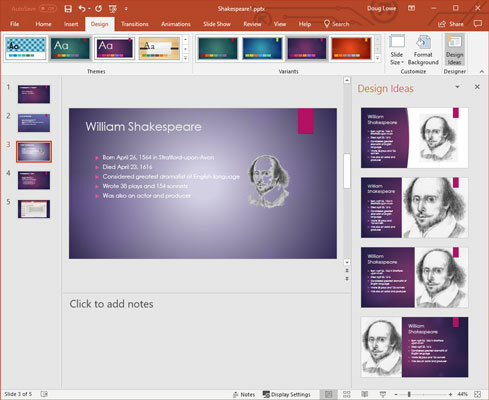 This figure shows how the Design Ideas feature has suggested some design alternatives for a slide that contains a picture of William Shakespeare. To use one of the suggestions, simply double-click it in the Design Ideas pane. Using the Design Ideas feature. In some cases, the Design Ideas feature will suggest artwork to complement your slide. PowerPoint actually examines the text on your slide to select relevant artwork. For example, this figure shows suggestions made for a title slide that mentions the word Shakespeare twice. PowerPoint has figured out that the classic comedy and tragedy drama masks might be appropriate for this slide. Note that the first time you use the Design Ideas feature, PowerPoint will ask for your permission. Be aware that the Design Ideas feature submits the content of your slides to Microsoft’s servers to generate design recommendations. If you’re concerned about the privacy of this feature, you may want to refrain from using it.